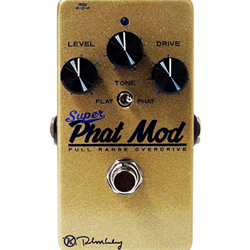 The Phat Mod is a favorite tone for many guitarists. It has a natural break-up that just feels good and the dynamics make it come alive. That’s the reason the modified pedal has stayed on people’s boards for nearly 15 years. The Keeley Super Phat Mod is this famous mod now perfected with amazing sounding JFETs that emulate old tube amps. The original pedal featured tube-like amp stages, tube amp tone stacks and a variety of tone shaping circuits that bring out the best in any guitar’s pickups. The problem with doing one in the past has been to finding the perfect FET to capture the magic. After all these years, Craighton Hale stumbled upon a Toshiba device that had the magic. The Super Phat Mod pedal now has incredible dynamics. It is full range and very responsive. The phrase “transparent overdrive” was born of this design. From country, to blues and rock the Phat Mod is the choice for those not wanting the over-refined sound of a common screamer. Set the gain high and let your guitar’s volume control or your pick attack do the work. With the Super Phat Mod you now have all of our refinements, the very best of tone-shaping electronics, and modern features like true-bypass.